Petonoquot’s grandfather, who grew up during the end of the Victorian era, is one inspiration behind the artist’s current Montreal exhibition, Rebellion of My Ancestors. It’s the first solo show for the artist from Kitigan Zibi. The exhibition combines fibre, beadwork, photography, printmaking and performance to share Petonoquot’s research and stories with the public. “My main goal as an Indigenous artist is to teach people,” said Petonoquot. 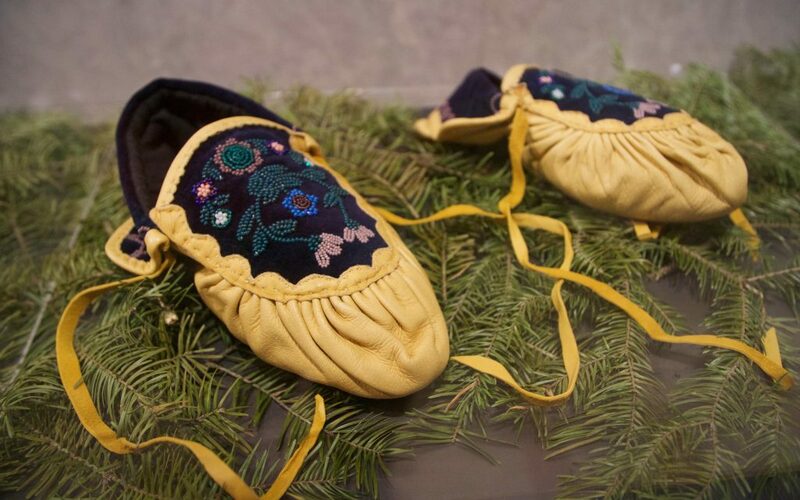 These moccasins are a work titled, “I Helped my Mother as my Feet Touched the Ground” which recalls what Petonoquot’s father taught her — that when we step on and spread spruce needles, we help more trees to grow. While creativity has always been a part of her life, Petonoquot said she started the research – focussed on Canada’s reserve system and the use of welfare as a colonial method of control – that inspires her art while studying art history and photography at Concordia University in Montreal. “When the colonizers had realized that they couldn’t keep us from leaving the reserve to hunt and trap, they started doling out free money,” Petonoquot said. “I don’t think they called it welfare during the Victorian period, but welfare was used as a mechanism to keep Natives on the reserve,” said Petonoquot. Rebellion of My Ancestors is shown as part of Petonoquot’s residency at the Montreal Museum of Fine Arts. She was the first Indigenous artist to receive the museum’s Impressions residency. The show is like a “self-portrait” of Petonoquot, said the artist, who said she does not seek to represent her community or other Indigenous people through her work. Petonoquot taught herself to bead at the age of 25. Her beadwork pushes the medium into a contemporary direction by mixing different influences, she said. Down to the details, every element in the exhibition represents a specific idea. “I found out how the Victorians had gained so much power over us – they made us legal wards of the state. I would argue that’s forced infantilism,” said Petonoquot. That discovery led Petonoquot to include a baby bonnet in a piece titled The Reservation Bonnet. The exhibition is open until January 15 at the Conseil des arts de Montréal. A tea bag filled with soil from Kitigan Zibi hangs from the bonnet, representing “what was important to the colonizers when they came here, and that was land,” Petonoquot said. 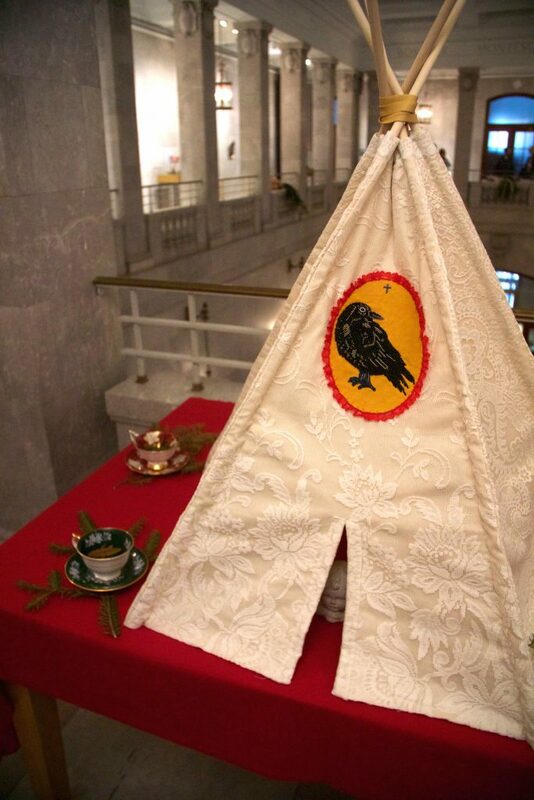 Petonoquot used Christian symbols throughout the artwork, from hanging the tea bag from a rosary to beading crosses into christening gowns.